The Catholic Through the Year Planner from Catholic Sistas covers all the bases. 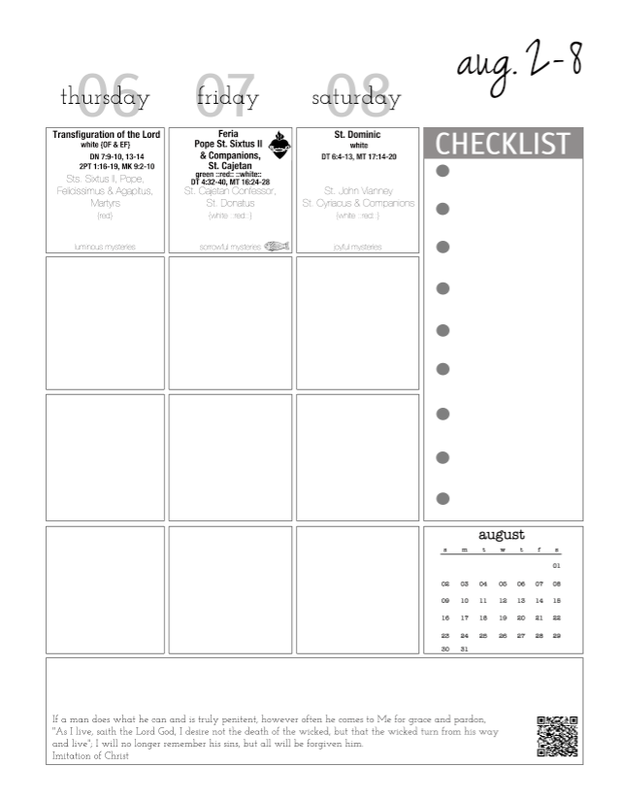 In the sample page at left (half of a 2-page weekly spread) you’ll see that the top box for each day is dedicated to the Catholic part of the planner: daily readings, saints/feasts of the day, and even the daily mysteries of the Rosary. Fridays have a little fish icon to remind you to plan a meatless meal (here’s my opportunity for a shameless plug for my pet project, the Meatless Friday feature at CatholicMom.com!) Three boxes per day below that allow you to customize your planning to your own family’s needs. Then there’s a handy checklist along the side and an area for other notes at the bottom–with a quote from a saint each week. Customization is the name of the game with this planner. You can choose a calendar, homeschool planner, blog planner and household planner–or any combination of these. Want it all? Grab the Whole Enchilada. Everything is on sale through the end of today (7/31), and the prices can’t be beat! 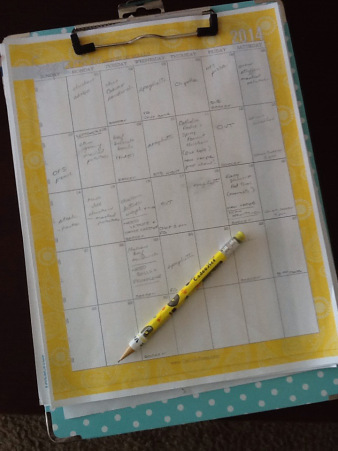 Catholic Sistas is generously offering a planner for one Franciscanmom reader. For your chance to win, name your favorite feature from this planner–check the list below for ALL that’s inside. The winner will be chosen at random from all comments made before August 7, 2015 at noon Eastern and will be notified by email. Remember, you’ve got to be in it to win it! Leave a comment to enter! Here’s how that monthly menu page looks after I get my hands on it! As you can see, I’ve used this planner before–this is a 2014 menu, but the format is still the same. This is a page that lives on my clipboard for quick reference. Planner image and header photo copyright 2015 Martina Kreitzer. All rights reserved. I have the calendar and homeschool planner, but would love to win one of the other ones. I love that the calendar has all of the Feast Days already listed for me. I just printed it out yesterday and have already begun filling it all in. I would like to enter. I would love the meal planning sheets and the liturgical planner sheets (I have never used anything so formal in planning our day / homeschool routine – but would love to be more organized for sure! I would love to try these. I really like the idea of having everything right there. I love the fact that the saints days are drawn from both old and new calendars! I think I’m going to have to become my mother and finally start keeping a good paper planner. This looks like a good candidate. Our winner is comment #3, BCARPAY! Look for an email with instructions on how to claim your prize! Congratulations!